Paul Manafort (center), standing with his lawyers, is introduced to jury pool on Tuesday. Former Trump campaign chairman Paul Manafort arrives at the federal courthouse in Washington, D.C., for a hearing in June. 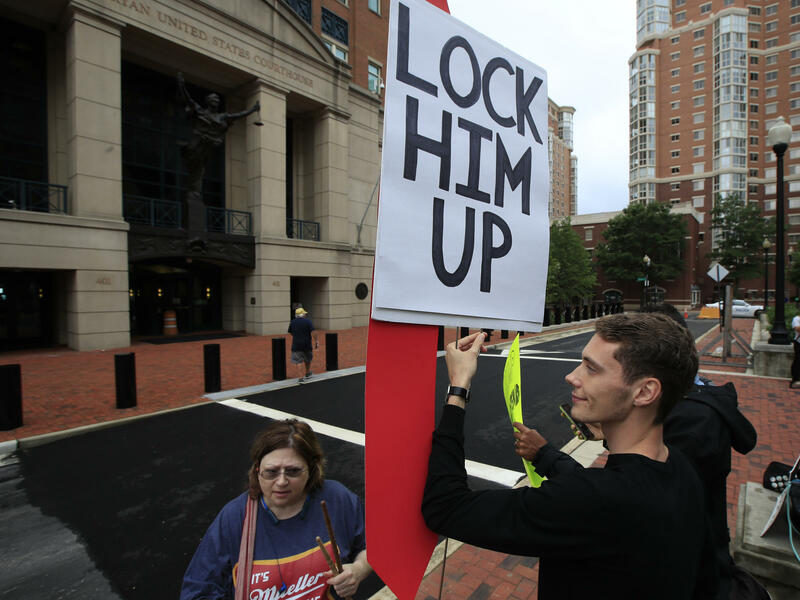 Gayelynn Taxey and Danny Hastings protest in front of the federal courthouse in Alexandria, Va., Tuesday. But the trial of Manafort, which began Tuesday in a suburban Washington, D.C., courthouse, is already upending those low expectations. The trial is the first brought on indictments by special counsel Robert Mueller's office. TV crews were in place setting up outside the courthouse before 5 a.m., and a jury of six men and six women, largely white, was seated before the lunch break of the trial's first day. There are also four alternate jurors, three of whom are women. Assistant U.S. Attorney Uzo Asonye's opening statement followed the strategy prosecuting lawyers have planned for the trial. They plan to call witnesses who they say demonstrate how Manafort spent his allegedly ill-gotten gains: custom-made suits, Persian rugs, landscaping fees, Land Rovers and Mercedes-Benz vehicles, and season tickets to the New York Yankees, among other items. Manafort is accused of paying for that lifestyle, which Asonye also specifically mentioned included a $15,000 jacket "made from an ostrich," by evading taxes on money he made for political consulting work in Ukraine and lying to banks to get loans. "A man in this courtroom believed the law did not apply to him," Asonye said. Asonye said Manafort made $60 million in Ukraine between 2010 and 2014, and operated 30 bank accounts in three foreign countries in an effort to skirt tax laws. Manafort's defense attorney, Thomas Zehnle, however, vehemently disagreed with that characterization in his opening statement. Instead, he presented Manafort as a self-made, second-generation immigrant, and a "driving force in the candidacy of multiple U.S. presidents." "Paul Manafort has rendered a valuable service to our system of government," Zehnle said. Manafort was often on the road, sometimes seven time zones away from his political consulting business, so he relied on his business partner Richard Gates to handle operations and finances, the defense lawyer argued. Gates abused Manafort's trust and allegedly embezzled from the business, only to take a guilty plea and become the government's star witness in the case. His goal was to save himself from prison time and having to pay back taxes, Zehnle said. Special counsel Robert Mueller did not appear in court for the first day of the trial. Two of his deputies, James Quarles and Aaron Zebley, sat in the audience for the opening statements. 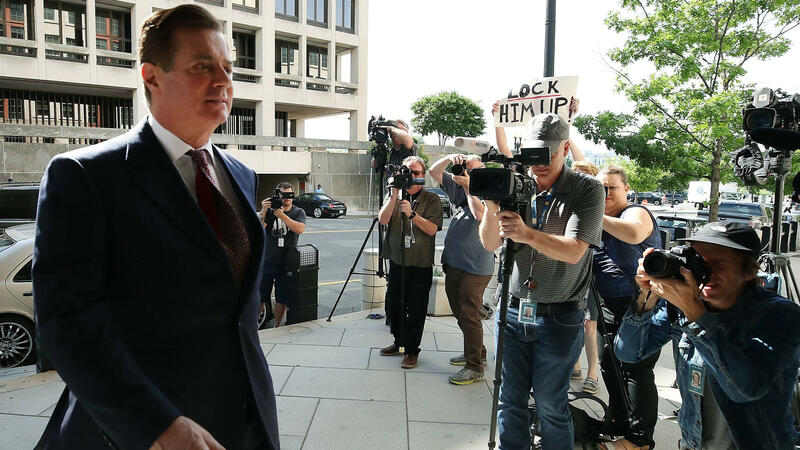 It's what may not come up much during the trial in Alexandria, Va., that will draw attention from all over the world: Manafort's work for candidate Donald Trump for a critical period in 2016 when Trump clinched the Republican nomination for president. In pretrial arguments, prosecutor Greg Andres told the court that the government would only bring up Manafort's campaign work in the context of a witness from a bank that gave him a loan, with the expectation that the banker would win consideration for a post in the Trump administration. "I don't anticipate that a government witness will utter the word 'Russia,' " Andres said. Manafort's defense team has argued that any mention of Trump could be seized on by jurors who have an unfavorable view of the president. "Evidence or argument relating to Mr. Manafort's work for then-candidate Trump's campaign in 2016 or the Special Counsel's investigation of the campaign's alleged collusion with the Russian government is wholly irrelevant to whether Mr. Manafort's personal income tax returns were false, whether he willfully failed to file reports of foreign accounts, and whether he conspired to commit, or committed, bank fraud," defense lawyers wrote. There was no mention in the courtroom of President Trump on the trial's first day. Judge T.S. 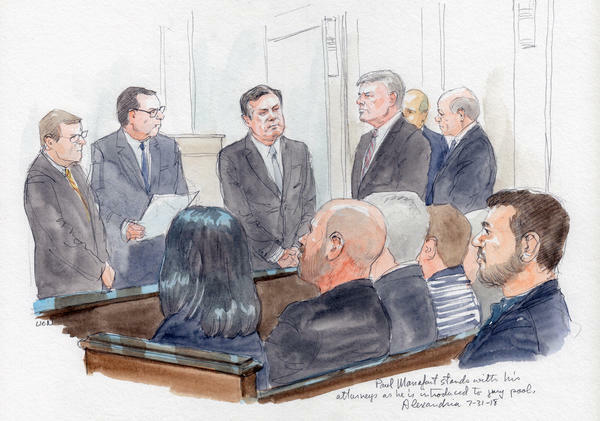 Ellis III opened the trial, and jury selection, by reading 60 potential jurors a brief summary of the indictment and reminded them that the indictment itself was "not proof of a crime." Already, Ellis has confronted questions about whether prospective jurors can be impartial in the highly charged case. Earlier this month, the judge denied a bid by Manafort to move the case out of Alexandria. The defense had worried that voters in Northern Virginia leaned more Democratic than in the western part of the state in 2016, but the Reagan-appointed judge said that was not the standard to assess whether a defendant could receive a fair trial. "On the basis of the record presented thus far, there is no reason to believe that fair and impartial jurors cannot be found in the Eastern District of Virginia," the judge concluded. The prospective jurors filled out a lengthy questionnaire that asks about their experience with the criminal justice system and their familiarity with Ukraine. Manafort's work for the pro-Russian government in Ukraine plays a central role in the allegations against him, because prosecutors say he concealed income from that work from U.S. tax officials and allegedly laundered more than $18 million in proceeds. The heart of the government's case involves nine years of Manafort's lucrative lobbying and consulting for Ukraine and its former leader Viktor Yanukovych, work the U.S. government said Manafort should have registered with the Justice Department. The grand jury indictment accused Manafort of funneling the money to offshore accounts in Cyprus, the Seychelles and other locations, as well as failing to report it to the IRS. When Yanukovych fled to Russia, Manafort and his business partner Gates experienced a severe cash crunch, and the men allegedly began leveraging real estate to take out new loans, providing false or incomplete profit and loss statements and other data to banks. Gates has since pleaded guilty and agreed to help prosecutors with their case, as one of the government's star witnesses. That leaves Manafort, 69, facing charges that could keep him behind bars for the rest of his life. Manafort's defense team has filed a flurry of motions — to suppress evidence gathered from a Virginia storage unit, to challenge the mandate of the special counsel and to delay the trial — nearly all of which it has lost so far. A legal defense fund set up to help cover his mounting bills praises his "lifetime of service" to "no less than four United States presidents." Responding to allegations that Manafort took the campaign job with Trump in 2016 to pay off debts he owed to a Russian oligarch, the defense fund website asserts that he was "motivated solely by his appreciation and ardor for our country." "Hearing the voice of so many Americans who felt unrepresented by our government, Paul helped to define Donald Trump's core beliefs and, along with other remarkably talented individuals, they achieved what is believed to be one of the greatest victories in the annals of any presidential campaign," the defense fund site said. But that lofty rhetoric stands in contrast to Manafort's current circumstances. His legal burden grew heavier in mid-June, when a different judge, in Washington, D.C., ordered Manafort to jail, as a flight risk. A grand jury in D.C. had indicted Manafort on new charges — of alleged witness tampering — for contacting people who could testify in the cases against him. Authorities initially detained him more than 100 miles away in the Northern Neck Regional Jail in Warsaw, Va. His lawyers cited the distance in a bid to postpone the trial until autumn at the earliest. Instead, Ellis directed U.S. marshals to move Manafort to the detention center in Alexandria, near the courthouse. That facility has housed a variety of prominent defendants including Sept. 11 conspirator Zacarias Moussaoui, and spies Robert Hanssen and Aldrich Ames. The judge told potential jurors that the trial would last no more than three weeks. When it is over, Manafort will not quite be done with the justice system. He faces a separate trial in late September in Washington, D.C.
Special counsel Robert Mueller was tapped to look into possible collusion between the Trump campaign and Russia during the 2016 election. At the same time, Mueller was empowered to pursue any possible crimes that might come up in the course of that investigation. Enter Paul Manafort - President Trump's former campaign chairman is facing charges of financial fraud, alleged crimes that were uncovered through Mueller's larger probe. Jury selection in Manafort's trial starts today. NPR justice correspondent Carrie Johnson has been covering this case from the very beginning and joins us now. Good morning, Carrie. CARRIE JOHNSON, BYLINE: Good morning, Rachel. MARTIN: All right. So financial fraud - that is the catch-all phrase we use to describe what charges Manafort is facing, but can you get a little bit more granular for us? What exactly is he accused of? JOHNSON: Sure. Remember that Paul Manafort is a brand name in part because he was the Trump campaign chairman for a key part of 2016 during the Republican National Convention. But these bank and tax fraud charges against him go all the way back to 2005. This case today revolves around lucrative lobbying work that Paul Manafort did for the government in Ukraine, the pro-Russia government there. Prosecutors say he earned more than $60 million and failed to report a lot of it on his tax returns. He also allegedly failed to register his foreign bank accounts. And when that work dried up in Ukraine, Manafort allegedly borrowed against the value of real estate and then allegedly misled banks and lenders about all that. MARTIN: So now he's facing charges, and his trial is going to get under way today. Are prosecutors going to try to make a connection in this trial to possible collusion between the Trump campaign and Russia? I mean, is there any way that comes up? JOHNSON: Well, quite the opposite, Rachel. Prosecutor Greg Andres said in pretrial proceedings that it's unlikely any government witness will actually use the word Russia. The heart of the government's case, the government's witness list, includes accountants, people familiar with Paul Manafort's money and other people connected to how he spent that money. Expect to hear about the purchase of expensive rugs, New York Yankees tickets, real estate and expect to hear from Manafort's former right hand man, Rick Gates, who was charged alongside Manafort and later pled guilty and flipped. Looming over this whole thing, though, is whether Manafort has any information about Russia and the Trump campaign. Remember; Manafort did attend that Trump Tower meeting in June 2016. So far, no sign that he's going to flip. MARTIN: Do we know anything about his defense strategy? Are his lawyers indicating what arguments they're going to try to make? JOHNSON: They have not previewed their strategy too much. They filed a lot of motions in this case to delay the trial - to the mandate of the special counsel, and they've lost almost all of those motions. We do know Manafort's lead lawyer, Kevin Downing, has said from the start that Manafort's innocent, there was no collusion with Russia. And the defense seems to be arguing that but for Manafort's work on this Trump campaign, he never would have been charged with a crime. MARTIN: So you are, I understand, across the street from the courthouse right now where you've set up your makeshift studio. Are there lines forming to get in there? JOHNSON: A line did start forming shortly after 6 a.m. And what we're expecting is that the judge is going to hear some pretrial arguments about limiting evidence in the case. And then later this morning, he's going to start questioning prospective jurors. He wants 12 jurors and four alternate, 16 in all. These prospective jurors have already filled out a written questionnaire. The judge is going to follow up, make sure they can be fair and impartial. And the judge in this case, T.S. Ellis, wants this process to move quickly. He's told the jury pool the whole case will last no more than three weeks. MARTIN: So it's interesting to kind of think how President Trump has changed his rhetoric on all of this. I mean, he has been consistent about attacking the special counsel to be sure, from the very beginning calling it a witch hunt. He's even gotten his national security adviser, John Bolton, to describe it as a witch hunt. At the same time, though, President Trump has been distancing himself from Paul Manafort recently, right? JOHNSON: Yeah. The president's lead lawyer, Rudy Giuliani, said this week if Manafort - and that Manafort and Trump didn't have any intimate business dealings at all. Giuliani also said that Manafort had no incriminating information against the president. Giuliani said they can squeeze Paul Manafort, but he doesn't have anything. Now, Trump has also said that Paul Manafort is a good guy being treated brutally by the government. There is a chance that Manafort could decide to cooperate with investigators down the line. Remember; he's 69 years old. If he's convicted of these charges, it could be a virtual life sentence in prison for him. MARTIN: All right. NPR justice correspondent Carrie Johnson covering the beginning of Paul Manafort's trial. He is, of course, the former campaign chairman for the Donald Trump presidential campaign. Hey, Carrie, thanks so much. JOHNSON: My pleasure, thank you. Transcript provided by NPR, Copyright NPR.